Shift work. It’s not for everyone. However (and I hate to brag…) shift workers pretty much make the world go around. We work days, nights, evenings, split shifts, short shifts, long shifts and everything in between, every single day of the year. As I have said before, shift workers only ask for a bit of understanding and tolerance if we are confused, tired, unavailable for social events, wondering aloud what day it might be or jamming chocolate into our faces at 2 am. Shift work definitely has it’s perks though. Things like days off during the week, being paid shift allowances or loading (industry dependent of course) and a convenient excuse to get out of social occasions you’d rather avoid. What more could you want, really? I know it doesn’t sound all that glamorous, this whole shift work thing. That would be because it usually isn’t. If you’re contemplating joining the ranks of the shift workers in some capacity, then chances are that you aren’t too concerned with glamour and you probably know, at least on an intellectual level, that it can be pretty tough. However, there are a few things you can try that will make your life a whole lot more comfortable. These come in all kinds of colours and are often triple-layered and coated with something (Raincoat material? Anti-matter? No idea!) or not coated but possibly extra layered. Or extra thick. Or something. It doesn’t matter. The point is- you actually need these. Spare no expense. Kit your bedroom windows out with these as soon as humanly possible. Sometimes, you’ll lay down for a nap before a night shift and the daylight seeping through regular blinds and curtains will be just enough to keep you awake. You need to learn to trick your brain into believing it’s sleep time. 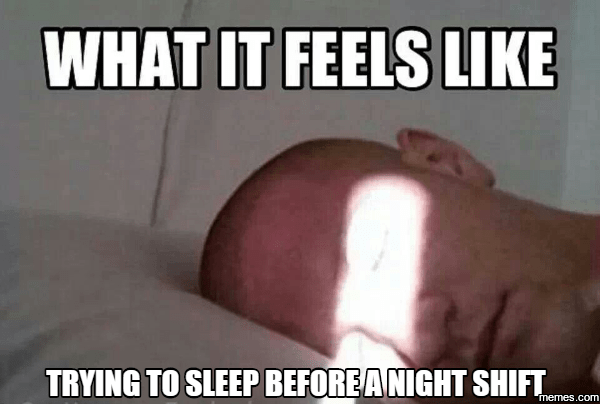 Even sleeping during the day after a night shift and before another night shift can be completely screwed by a room that just isn’t quite dim enough. These curtains are an essential tool in your brain-tricking arsenal. I’ll level with you- I find them vaguely uncomfortable to sleep in. I’m a side-sleeper so I find that while they don’t hurt or anything like that, I’m generally just conscious of them. That said, going to sleep with ear plugs in is better by far than going to sleep when there is ridiculous and prolonged noise going on in your street. You know, like when people do completely unreasonable things like home renovations, car repairs and garden maintenance. Neighbours are bloody notorious for choosing daylight hours to use lawn mowers and whipper snippers. We all know what a mess that can make, so some like to tidy that up with a leaf blower, because (essentially noiseless) brooms are so passé. Vaguely uncomfortable earplugs win, every time. Do not go to bed hungry. If you are on day shift, this is no real drama. Eat dinner and go to bed, right? It’s the night shifts where this is a problem. Some people get home and stay up for a couple of hours, either out of preference or necessity. Me, I like to stay up for a bit then drag the covers over my head and stay there as long as possible. Some days, however, I barely make it up the stairs to my bedroom. On these days, I’ve learned to swing by the kitchen. Even the most rudimentary single-slice peanut butter sandwich will do. Or a banana. The half-bowl of soggy cereal your 3 year old didn’t finish works just fine. I am sure there is some recommendation that says not to eat immediately before going to bed. You have to wait 15 minutes or you might get a stitch. Maybe I’m thinking of swimming? I’m not sure. My point is, it doesn’t apply here. We are not talking a 3 course breakfast here, just something small. By this time, you probably haven’t eaten anything since your 2 am cake break or possibly since the night before, depending on the kind of work you do. Going to bed when you’re so exhausted that it overrides your hunger means, in my experience, that you will enter the Land of Nod promptly- but it will be a fleeting visit. You’ll get an hour or two before your stomach sends urgent signals to your brain to wake the hell up and demand an omelette from the nearest member of your household or (if no one else is home) to forage in the kitchen for whatever meets the criteria of fast and tasty. If you have a snack before bed, you stand a better chance of more sleep. You are also less likely to wake in a couple of hours and eat a block of cheese and a bowl of cold spaghetti or whatever else you stumble on that meets the ‘fast and tasty’ criteria. Win win. You must find a caffeine. I’m not saying all shift workers are reliant on caffeine. Well, maybe I am. I don’t know- I can’t speak for all of us, but I know a good coffee makes the early starts somewhat bearable. And when you are getting up before the sun, bearable is about the best you can hope for. I understand not everyone likes coffee. Some prefer tea. Good news- tea has caffeine in it, too! You may need a couple of those. If you’re some kind of weirdo that doesn’t drink hot drinks, like my husband, you may need to look into alternative sources of caffeine. Not only does caffeine take the edge of an early start, it can help to get you through a long night. Part of shift work is being able to function even when you’re pretty tired. I think parenthood has helped me with that aspect, as well. But I still swear by a good, strong coffee. I’m no dietitian or expert, but I’m pretty sure you aren’t meant to overload on the stuff though- a 2-3 a day, maybe one more if you’re desperate? Sounds reasonable to me. There is absolutely nothing worse than struggling to sleep while dealing with noise, hunger, daylight and whatever else our poor, confused brains throw at us. Some people will recommend herbal teas or meditation exercises and they may well work for you. I’m not saying don’t try those out before exploring your pharmaceutical options. I just know that the teas don’t do anything much for me, the meditation soundtracks confuse me (think whales singing in the ocean to nearby tropical birds) and I’m just not very good at the whole thing. I have used over the counter medications to help me sleep on and off for several years. I had a chat to my GP, who told me what I could safely try, with the idea that if they didn’t work out, I could return for something a little stronger. I didn’t need anything stronger. Most sleeping aids are basically to help you get to sleep, which is what I struggle with every now and then. If you are new to shift work, or even an old hand at it who isn’t sleeping all that well, ask your doctor what you can take from time to time. Personally, I wanted something non-habit forming, safe and relatively mild for occasional use. For the most part it’s not an issue but I like to know that there is another option to help me sleep if I’m really stuck. Ever done shift work? Any tips to add?